1999 Royal Enfield Bullet proudly parks at the Dania Beach Vintage Motorcycle Show. 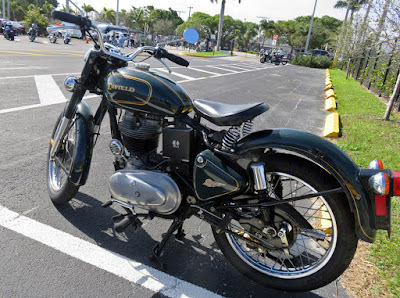 My 1999 Royal Enfield Bullet didn't enter the 2018 Dania Beach Vintage Motorcycle Show. It's not old enough. 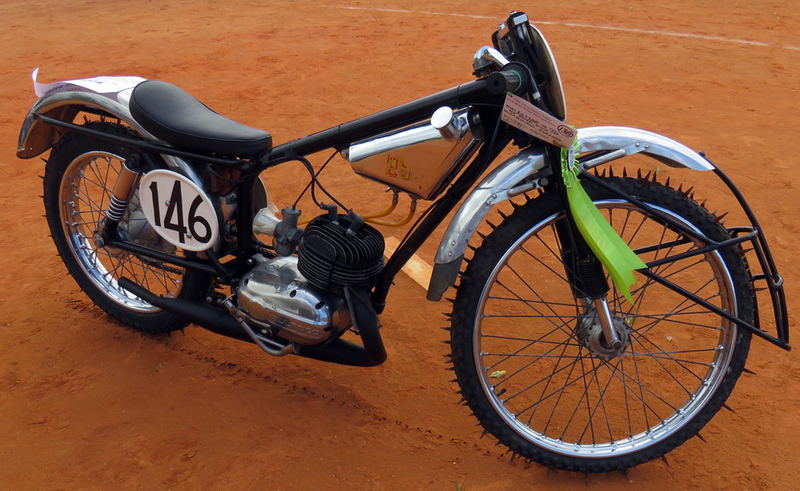 No motorcycle newer than 1983 was allowed on the field. 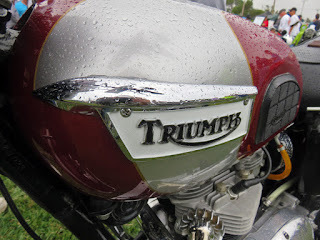 The show is for vintage motorcycles. Simply being obsolete isn't good enough! 1948 Triumph 5T Speed Twin, shown by Douglas Spranger of Port Orange, Fla. He told me he'd wanted a 1947, his year of birth. Surely, this will do fine. I was interested to see the provisions for a tire pump on the chain guard. 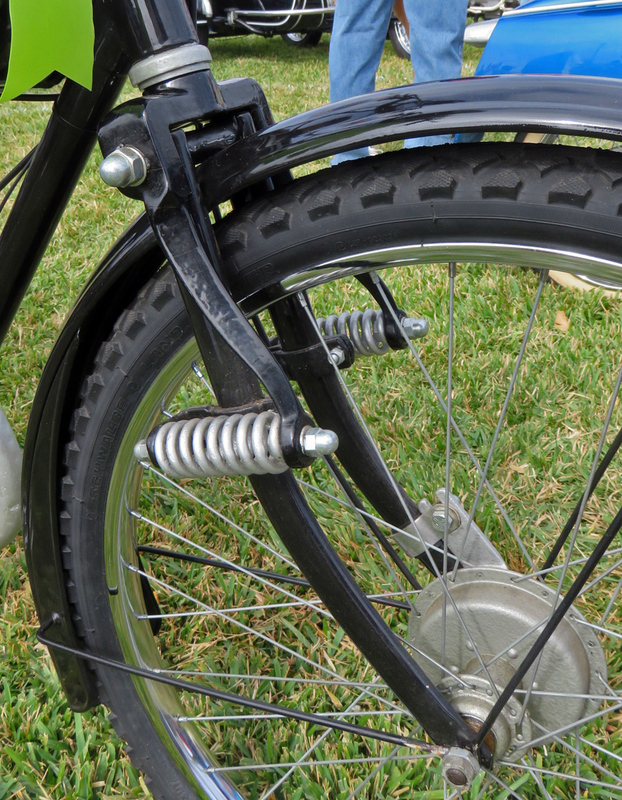 Especially nice is the extra "lip" to keep the pump out of the spokes! Looking lethal just to get near is the 1970 Elstar ice racer. 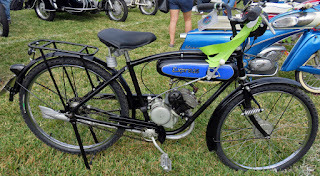 This very bike appeared in the 1972 movie "On Any Sunday." 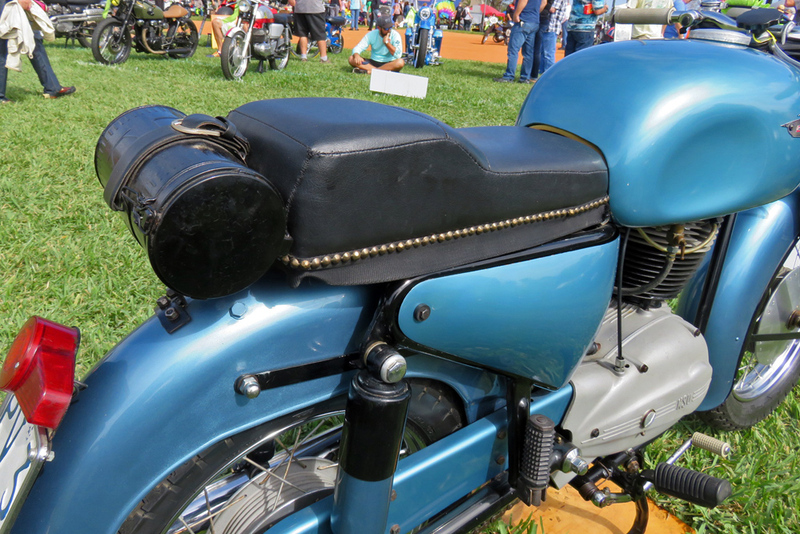 restored by Wes Scott. It normally lives in an air conditioned living room! 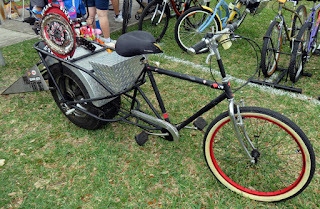 Vintage and custom bicycles have their own area at the Dania Beach show. Many customs are almost as insane as this pedal powered dragster. shown by Mike Gokey, of Fort Lauderdale, Fla. 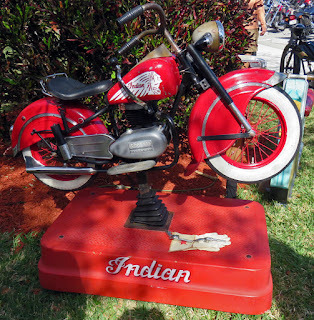 Antique Lenaerts coin-operated Indian motorcycle really worked. The kids loved it. Highly detailed, with electric horn. But it's impossible to beat a real Indian 4 for magnificence. 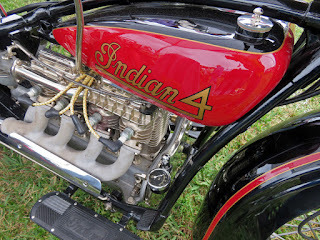 This is a 1931 Model 402 shown by Steve Obst, of Plantation, Fla. 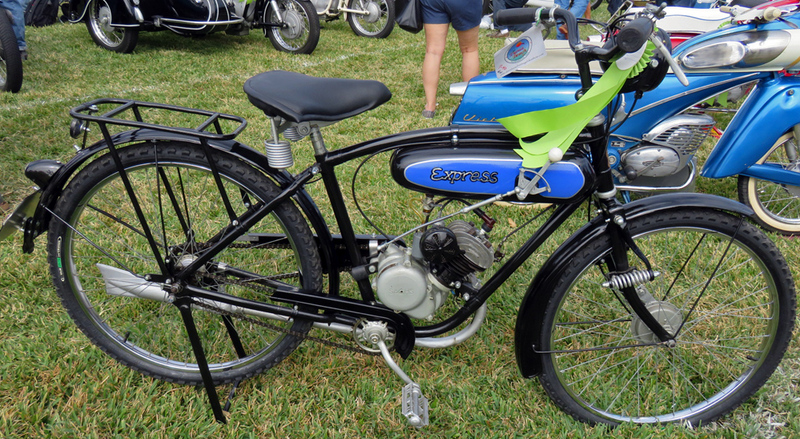 In another class entirely is this 1934 Express lightweight. Shown by Peter Kisgen, of Pompano Beach, Fla. The Express featured crisp looking front suspension. 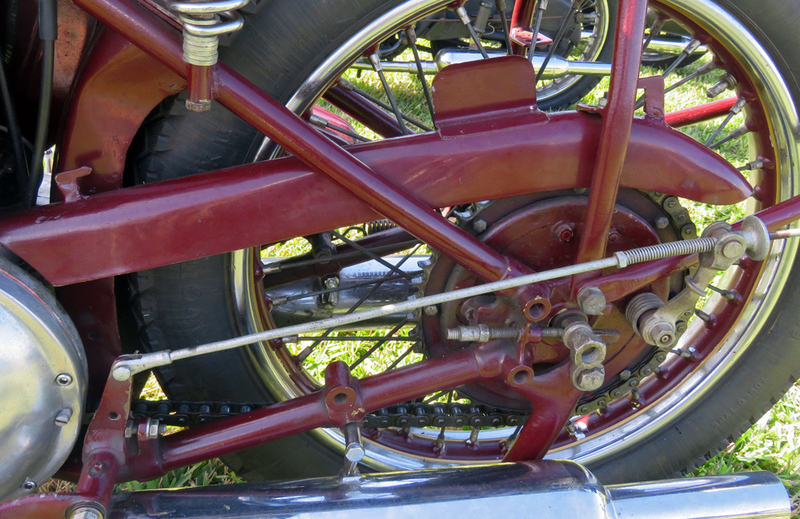 Hinged forks swing against coil springs fixed to headstock. worked, in 1969. 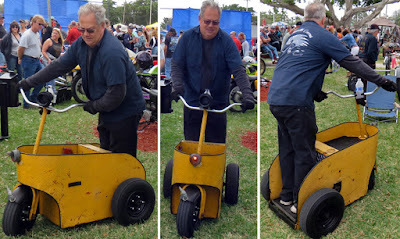 Meant for fetching parts to fill orders; of course we raced them. 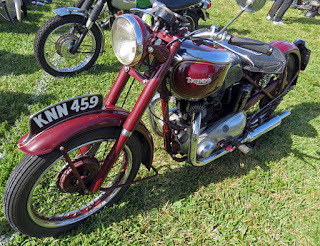 Since only the right-rear wheel was powered they slowed considerably when turned left.